Who would have thought that the emperor Charlemagne would make friends with an albino elephant, a gift from the caliph of Baghdad? 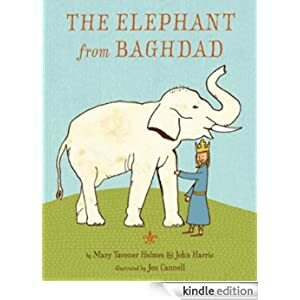 Told from the fictionalized point of view of a monk who set down the actual story in 883 884 CE, the book follows the elephant’s journey through Egypt, across the Mediterranean to Italy and across the Alps to Germany. When the elephant finally reaches his destination, Charlemagne is so delighted with his exotic new pet that he introduces him to his many children and bathes with him in the hot springs near his palace. When the elephant dies of old age, the emperor is heartbroken.